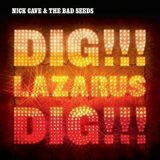 Nick Cave and the Bad Seeds - Dig, Lazarus, Dig!!! Few expected Nick Cave to live long enough to produce fourteen albums, let alone with a project that wasn’t even the one he started his career with. He’s lived the Rock N’Roll lifestyle to the natural conclusion of excess, and isn’t regretful at all (a recent interview saw him saying that he had a great time whilst addicted to heroin, far from the regretful tone most ‘rock stars’ pretend to take) and now, past the half-century mark, he’s making some of his best work. 2007’s Grinderman project (review coming soon) saw him take up the guitar and make noisy Garage Rock that’s a shitload better than the doleful dreck that’s droned out by those half his age, and the latest album released under his ‘&The Bad Seeds’ moniker is a delight. It rocks, it rolls, and it shits over most of the nonsense that you’re likely to hear if you inquisitively turn on your radio to see what the state of Rock is, circa 2008. As ever, this is a respectfully traditional yet gloriously experimental take on Rock, the band’s Post-Punk past as obvious as ever, and as you might expect from a band that also includes Dirty Three multi-instrumentalist Warren Ellis and former Birthday Party guitarist Mick Harvey, this is a collision of sounds that you’d be lucky to find elsewhere. Dig, Lazarus, Dig!!! is a damn good album. From the lyrics, written with all of Cave’s usual wit and panache (‘He likes to congregate around the intersection of Janie's jeans, Mr Sandman the inseminator/ he opens her up like a love-letter and enters her dreams’) to the music itself, the progressive-in-all-but-name mixture of instruments that only reveals its imaginative complexity after many listens, this is the mark of genius at work. I could write pages about any of the tracks present; although it’s likely that once you’ve heard even one song from here you’ll be convinced, whether it’s the catchy Alt-Rock shuffle of the title track, the laid-back Rock N’Roll of Today’s Lesson, or the hypnotic drawl of More News From Nowhere, an album finale to rule them all. One of these, or others, will be the gateway track that propels you through and lets you enter this peculiar world. Surprises come a-plenty, including the atmospheric experimentalism of Night Of The Lotus Eaters, the guitar-heavy Albert Goes West, and the infectious We Call Upon The Author. The title of the album refers to the Biblical miracle of Jesus’ resurrection of Lazarus of Bethany, and as ever, Cave’s Christianity has a large bearing on the lyrics, although his individual take on it is, as usual, fascinating. Did Lazarus want to be resuscitated, Cave humorously asks, relocating the walking corpse to hip New York in the title track and taking him around San Francisco and LA, whilst ‘Larry’ “stockpiled weapons and took pot-shots in the air/he feasted on their lovely bodies like a lunatic and wrapped himself in their soft yellow hair’. Even reading the lyrics is a delight, although obviously they’re much more effective when heard as Cave intended. All tracks present have excellent lyrics, as mentioned, but the music itself is not to be ignored. The strange background noises of Hold Onto Yourself add much to the weird atmosphere of what is otherwise a slightly Western-y ballad, whilst Lie Down Here (& Be My Girl) takes a Dylan-esque base and builds upon it, adding liberal doses of guitar and group vocals, resulting in a pissed-up bar-room singalong that is as loose and unforgettable as a song can get. Don’t ignore Jesus Of The Moon, a tender trawl through a relationship’s end with added flute, and the post-drinking session lament of Midnight Man – both excellent tracks. In fact, there’s not a poor song on the album. The especial genius here is that whoever you are, everyone will hear something different whilst listening to Dig, Lazarus, Dig!!! and everyone will have their own favourite moments. As ever with this band, this isn’t so much an album as a voyage of discovery, the sort of listen that you can wrap yourself up in and explore at your leisure, the sort of album that’s all too rare these days when albums aren’t so much ‘albums’ as collections of singles. You have to listen all the way through; you can’t not after hearing the aforementioned gateway track and becoming fascinated. Whatever your moment was, your transition from being a music fan checking a recommended band out to a Nick Cave addict, you’ll never look back. This isn’t a journey to be undertaken lightly, but if you count yourself a fan of music this is not a band that you can safely ignore. Dig, Lazarus, Dig!!! is more than just the fourteenth album from a cult band unfairly ignored by the mainstream (despite past successes like the Kylie duo) but their latest triumph, and a highlight of 2008.